Today, I would like to introduce Campanula (also known as the Bell flower). 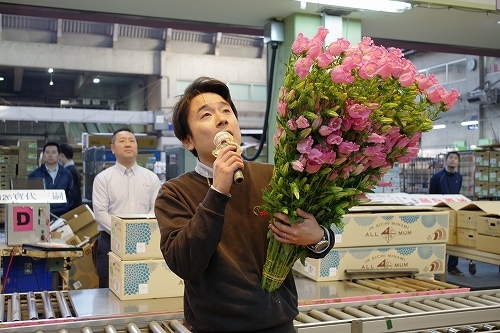 The Itoshima Growers Cooperative is one of shippers of Campanula. Two growers in the Cooperative ship them to our auction market from January, as per every year. Its line-up consists of 6 varieties, Champion pink, Champion purple, and 4 colors of Chime (small flower). 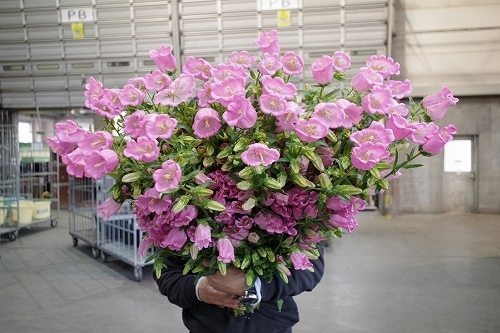 The characteristics of Campanula from Itoshima are that they ship flowers one-third in bloom with fully-bloomed top flowers. As they are harvested after they have already begun to bloom, there can be found some sweet nectar spots on the flower petals. Though, flower quality is trusted because these spots are not caused by any damage. We receive Campanula from Itoshima until around the end of the Mother’s Day.